I'm back. Last week was a rough one. My brother died...but now it's time to get back to work on Palm Springs Daily Photo. 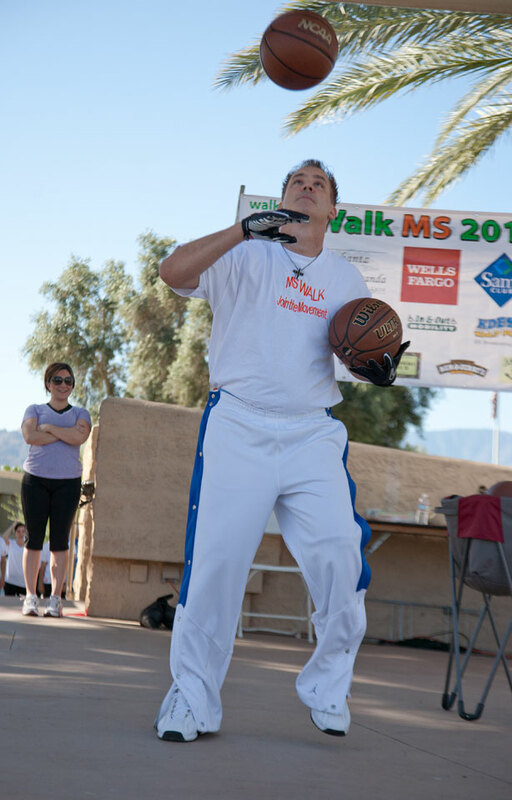 Here we have James Allwhite of Palm Springs doing his sports dance. He was a University of Arkansas football player, who now runs a fitness business in Palm Springs. He's also a trainer at World Gym. James is an outgoing guy, so many of you from Palm Springs probably recognize him. His services are first-rate. In addition to being a trainer, he also offers massage and embroidery. 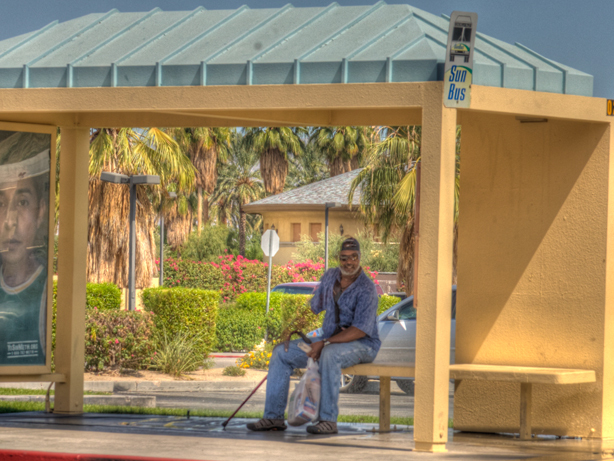 Back in 2007, I wrote about Sun Transit, the Coachella Valley's fine transit agency. The buses are clean and comfortable, arriving and departing promptly at scheduled times. The ride is cheap (only $1), and the bus permits you to take your bicycle with you. A great day trip would be to ride the bus from Palm Springs to the East Valley, getting on and off at locales that interest you. Taking a tour of Rancho Mirage is one trip you can opt for, stopping at the Cancer Survivor's Park and then having lunch and/or seeing a movie at The River (Highway 111 and Bob Hope Drive). You have a great choice of restaurants there--Cheesecake Factory, Old Spaghetti Factory (just opened across the street from the complex), Babe's (food's rather sweet tasting if you like that kind of thing) and Baja Fresh (if you want something quick and cheap). The first thing that a visitor notices when he comes to Palm Spring after driving the barren stretch of Highway 111 leading into town is the Frey gas station. 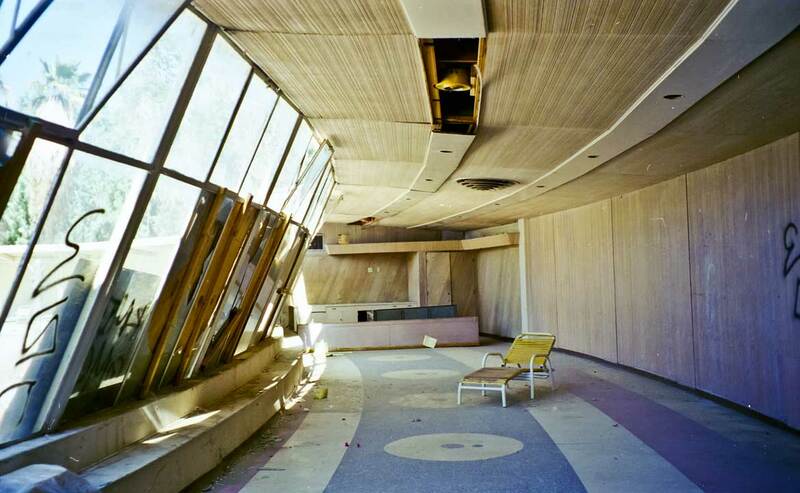 Its mid-century modern roof steers to the sky and window walls fully reveal the contents of the interior. As you drive further down the road, a vast collection of mid-century modern furnishings distinguished by a streamlined, minimalist design appear through the towers of glass. Once you see this, you know you're in the Design District, the hipster locale where shopping for modern is like exploring another time in another place, a time-machine back to the middle years of the last century. Inside one of the mid-century modern buildings midway through the Design District is a La MOD, one of the largest mid-century modern shopping venues in town, furnishings and accessories fill several rooms with signature styles from who's who list of designers--Eames, Paulin, McCobb and Nelson, to name a few. You can't help but to walk around and stare at the unique pieces, exploring every curve and line. 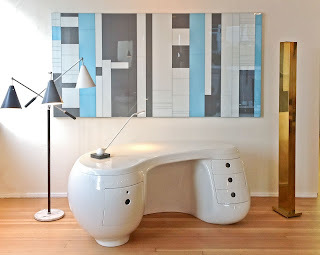 In one of the store's nooks a Calka boomerang desk ($75,000), an Arredoluce Triennale reading lamp ($7500), and Palm Springs artist Robert Larkin's gray and white glass panels accented with robin's egg blue ($9800), exciting pieces that give Palm Springs shoppers modern design within reach. "The desk is something you'll only see in a museum," says James Claude, who owns the store with his partner, Miguel Linares. 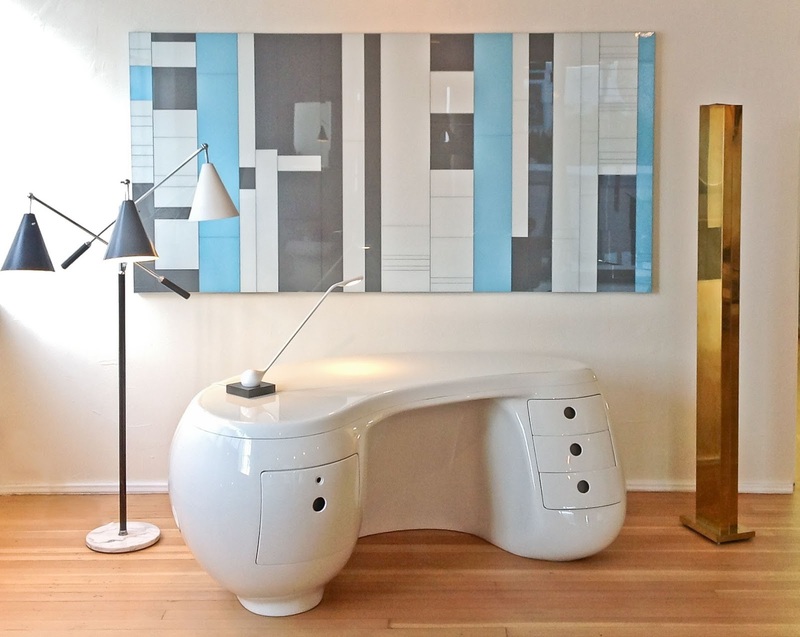 "This boomerang desk is one of thirty that were made in 1970." Claude sweeps his arm around the coordinated furniture vignette adding, "the pieces together are an equation for balance." Claude affirms the fact that Palm Springs is the the best spot for vistors to get an eclectic choice of reasonably priced, original mid-century modern items. "We have a wide selection of furniture and accessories that you can't get anywhere else in the world." Marilyn has arrived safely after a treacherous trip from Chicago's Pioneer Square on Michigan Av. The over-the-top sculpture costs tens of thousands of dollars to be taken apart and transported from Chicago. The icon's return is just in time for the August 5th commemoration of the 50th anniversary of Marilyn's death. The most controversial part of the statue--her undergarments--can't be seen yet because the statue is blocked off by a fence, prohibiting gawkers from walking underneath her skirt. We can thank Seward Johnson for constructing the 26-foot tall statue, which took several years to make. You might wonder where the artist got the money for such a big project. The answer lies in his connection to the Johnson & Johnson empire. The Chi Chi had a Polynesian theme. The Chi Chi (not Chi Chi Club) in Palm Springs had a great Polynesian theme. You couldn't tell from the outside, but once you walked in tiki was everywhere. The Chi Chi was one of the earliest nightclubs to have a Polynesian theme, a theme popular in the 1950s. 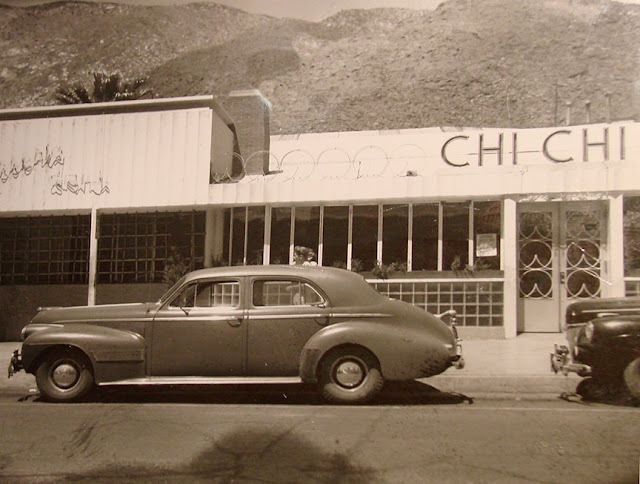 In 1941 the Chi Chi was one of the first tiki themed hot spot in the United States. While today there is no Chi Chi in downtown Palm Springs, there is Toucans at the north end, the only bar in the city that has a tiki theme. This doesn't mean that there are no private tiki bars in the city. Many homes have a tiki bar to accent their bare steel, concrete and glass architecture. I Love Lucy episode with guest star Rock Hudson. Have you ever heard of Rock Hudson ? The guy was incredibly tall. 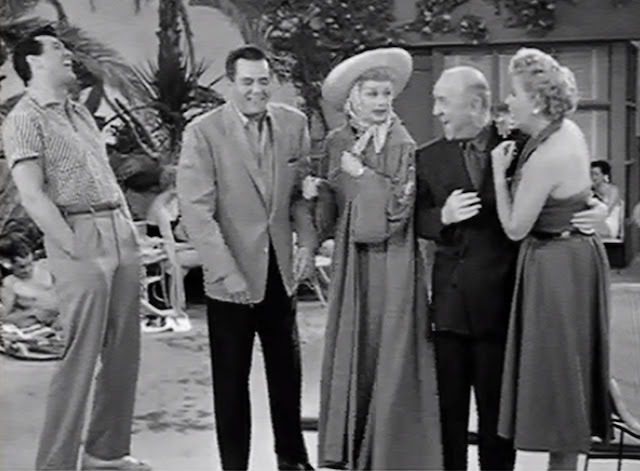 He guest starred as himself on a 1955 episode of I Love Lucy. The show is a bit goofy. Lucy is star-struck when she notices him poolside in Palm Springs. It was disappointing that the show wasn't filmed there, but, instead, on a Hollywood set (my guess). Lucy and Desi frequently went to Palm Springs, though--by helicopter. The copter would fly to the Canyon Country Club, which at the time was the place to party. Hudson also frequented Palm Springs with his wife, Phyllis Gates, lodging at the Racquet Club. After his marriage, Palm Springs was still on his agenda, a place he met various man-friends for some sun-worshiping. You can get the Palm Springs episode and every other episode in a set of DVDs:I Love Lucy: The Complete Series Watching them today on a big-screen TV is way better than when you watched them when they aired because back then television sets were not that big. Many of the shows are also on YouTube. Strollers downtown had the opportunity to talk vegan with two young women at the corner of Tahquitz and Palm Canyon. The pair were promoting PETA, an organization that advocates for animals. Their message was not to eat them. They had plenty to say about the benefits of being a vegan. Eating a vegan diet isn't easy. You can't eat anything that comes from an animal, even milk products. Are you a vegan in Palm Springs? If not, do you think you could go for a week on a vegan diet? Here's Veganomicon: The Ultimate Vegan Cookbook to help you cook. Old Biltmore Hotel in Palm Springs. This is the first time I've shown this image of the Old Biltmore Hotel in Palm Springs right before it was torn down in the early 2000s. The image is scanned from a negative...flashback to a time when I didn't have a digital camera. The place was really beautiful. You can't deny that this curvy room overlooking the pool through sloped floor-to-ceiling glass isn't dramatic. Along with the terrazzo floors, which awe the eyes with their geometrical shapes, the room is given a homey flare with blonde wood paneling. Too bad they tore it down. Speculation is that they had to because it was beyond repair. The new building--a condo complex--is boxy and uninspiring, a kind of faux modern that isn't nearly as hip as the old stuff.